She was awarded the 2017 Toronto Arts Foundation Emerging Artist Award and the Hnatyshyn Foundation Artist Award in 2018. In 2017, she was co-curator of the AGO exhibition Every. Now. Then: Reframing Nationhood. She completed an artist residency in 2017-18 at the University of the West Indies (Trinidad and Tobago) and is the former executive director of Whippersnapper Gallery in Toronto. She has a specialized honours BA in international development as well as a master’s in environmental studies from York University. 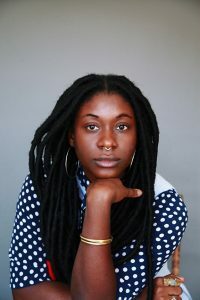 During her 2018-19 residency at Osgoode, she used the story of Clara Ford – a black Toronto-born woman who stood trial for the murder in 1894 of a wealthy white man who had allegedly assaulted her – to develop a two-hour, durational performance involving eight artists that brought this buried legal history into “a futuristic imagining of emancipation, freedom and the complexities of black survival.” Read the YFile story about the performance.